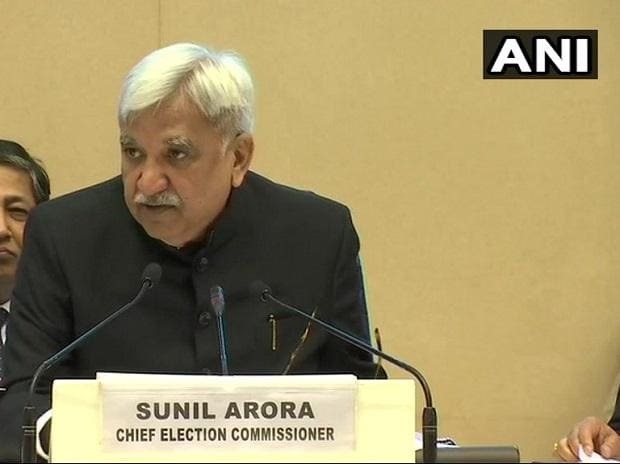 The assembly polls in Arunachal Pradesh, Arunachal, Odisha and Sikkim will be held simultaneously with the Lok Sabha elections but not in Jammu and Kashmir due to security reasons, Chief Election Commissioner Sunil Arora said Sunday. Andhra Pradesh, Arunachal and Sikkim will go to the polls for all seats in their respectively assemblies as well as the Lok Sabha in the first phase on April 11. Parliamentary and assembly polls will be held in Odisha across the first four phases on April 11, April 18, April 23 and April 29, respectively. The Jammu and Kashmir assembly was dissolved in November last year, months after the Mehbooba Mufti-headed government in the state fell following the BJP withdrawing support to it in June. Arora said the Election Commission decided to announce the schedule for only Lok Sabha polls in the state and not for the assembly elections due to inputs it had received from authorities regarding constraint of availability of central forces for enforcing security in the wake of recent violence. Even the parliamentary election for the Anantnag Lok Sabha seat in the state is going to be held in three phases, he said, underscoring the security challenge in the region. National Conference leader and former state chief minister Omar Abdullah slammed withholding of assembly elections and criticised the Modi government. "First time since 1996 Assembly elections in J&K are not being held on time. Remember this the next time you are praising PM Modi for his strong leadership," he tweeted. "In light of the failure to conduct assembly elections on time in J&K I'm retweeting my tweets from a few days ago. PM Modi has surrendered to Pakistan, to the militants & to the hurriyat. Well done Modi Sahib. 56 inch chest failed. #slowclap, Abdullah wrote on Twitter. The former Jammu and Kashmir chief minister said it was for the first time since 1996 that assembly elections in the state were not being held on time. Omar said in 2014, J-K had Lok Sabha elections on time and assembly elections on the schedule even after the most devastating floods, but delaying them now "shows how badly the BJP & earlier the BJP-PDP mishandled J&K. "What happened to (Union Home Minister) @rajnathsingh's assurance to Lok Sabha & Rajya Sabha as well as to the all party meeting recently in Delhi that all forces would be made available for simultaneous polls? he asked in another tweet. Omar said he never thought Modi would be willing to confess his failure on a global stage by not conducting the assembly polls on time in J-K.
J&K Pradesh Congress Committee president G A Mir said the tall claims of the Union Government with regards to the situation in Jammu and Kashmir stand exposed as the Centre has itself certified that situation is out of control and not conducive for holding simultaneous polls. Mir said it was the golden chance for the Centre to hold assembly election in order to give an elected government to the people as all the political parties were of the opinion that simultaneously elections should be held in the state. But, the Centre has once again failed to hold assembly elections citing the reason as volatile situation which is indicative of utter failure of the Centre to respect the urges and aspirations of the people, he said. Senior CPI(M) leader and former MLA, M Y Tarigami said the Election Commission decision has disappointed the people of the state in general. This was done despite that almost all the political parties had urged upon the Election Commission to hold both the elections simultaneously. Not holding assembly polls will send wrong signals to people within and outside the state, he said. He said the Chief Election Commissioner during his presser in New Delhi repeatedly quoted recent incidents of violence in Kashmir as the reason for not holding assembly polls. If that is true, then how could the Lok Sabha polls be held? Even the J-K Governor recently said that Prime Minister Narendra Modi complimented him for successful conduct of the civic elections in Jammu and Kashmir. When these polls could be held, what is the logic for deferring assembly polls? Tarigami questioned. The CPI(M) leader said J-K is without an elected government for the past nine months and in the absence of an elected government, uncertainty in the state is deepening day-by-day and dissatisfaction among a large section of people is increasing.